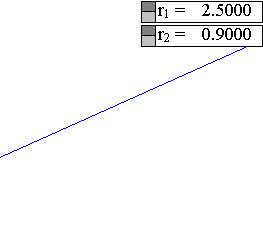 This is a continuation of the discussion initiated in Quadratic_Transformation.html . Look there for definitions and first properties. 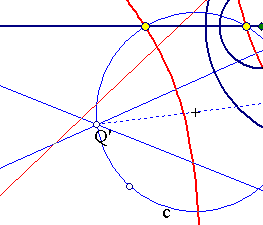 Here I apply the general theory to the case of a circle bundle (a special case of a family of conics) I(c1,c2), generated by two circles c1 and c2. 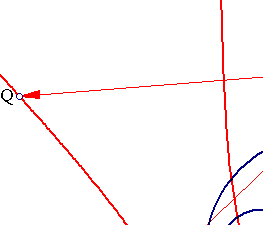 The Quadratic transformation leaves invariant the orthogonal bundle II(c1,c2) of the given one I(c1,c2), mapping each point P' of a member c of II(c1,c2) to its antipodal Q' in c.
 In the case of a bundle I(c1,c2) of non intersecting type, the images F(L) of lines under the quadratic transform are hyperbolas or parabolas passing through the limit points of the bundle. 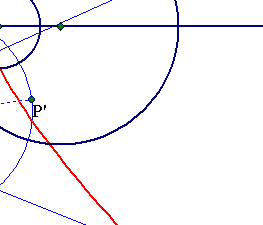 In the case of a bundle I(c1,c2) of tangent type (all circles tangent to a given line at a given point of it), the images F(L) are hyperbolas or parabolas passing through the common point and tangent to the line of centers of I(c1,c2). 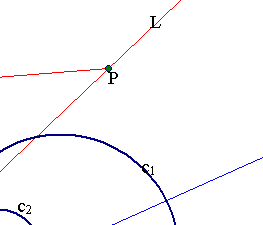 In both cases  and  the parabolas occur when line L is parallel to the line of centers of bundle I(c1, c2). Berger, M Geometry II Paris, Springer Verlag, 1987, p. 197.